Sizzling in flavor, beef hot links are a tasty dish for people who like spicy sausage. While the precooked links are ideal for grilling, they can also be cooked on the stove. The key to cooking links on the stovetop is to use water instead of direct heat. Direct heat can burn the outside of the sausage before the inside is heated. Boiling or simmering the sausage in water quickly heats the entire beef hot link without any scorching. It’s also a fat-free way to cook the sausages to perfection. Fill a pot with several inches of water. Place the beef hot links in the water and place the pot over high heat. Bring the water to a boil. Boil the sausages for around 10 minutes, or until heated thoroughly. Drain the water from the sausages. Pat the sausages dry with a paper towel and serve. Fill a heavy skillet with 1 inch of water. Place the beef hot links in the water and place the skillet over high heat. Bring the water to a simmer. Reduce the heat to medium. Simmer the sausages, turning frequently, for around 12 minutes. Add more water as needed to keep sausages halfway submerged during cooking. 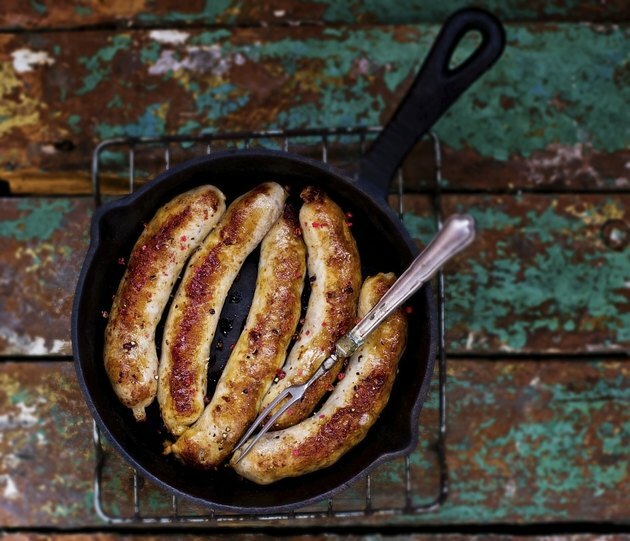 Remove sausages from skillet and pat dry with a paper towel. Boiling and simmering beef hot links yield almost the same results. The biggest difference is that simmering slightly browns the sausages as it heats them, whereas boiling only heats the meat. Simmer the sausages to heat them, then drain off the excess water and lightly brown the links if you prefer a slightly crunchier outside on your sausage. Serve the beef hot links for breakfast, lunch or dinner. They pair well with everything from scrambled eggs to hot dog buns. Don’t throw the sausages out if your hot links develop cracks as they cook. Cracks are a normal reaction that occurs when the juicy meat swells and breaks the casing. The links are still good to eat.